You get a lot of guitar for your money, and it sounds good. Fingerstyle playing could be better. Our trusty Collins English Dictionary describes an aria as “an elaborate accompanied song for solo voice,” which didn’t necessarily help guide our thoughts on the latest guitar to hit the UK from the Japanese company. When company founder Shiro Arai switched the spelling of his company’s name from the self-titled Arai in 1956 to Aria in 1958, he knew about this description, and it has probably helped business in Western and European countries since then. He modeled some of his earliest guitars on Fenders, but like many Japanese manufacturers in the second half of the 20th century, he was able to build products of equal quality or better for much better value. This doesn’t mean Shiro Arai cheated his way into guitar making: the knowledge and inspiration he drew from Kohno guitars and traditional Japanese instruments taught him well, and the same great attributes feature in each Aria today. Aria’s MSG range is no joke. One of the company’s endorsed players, Wangster JX of Malaysian band Djezna’s Stalker, uses the 05 model and you can see why Aria is proud of it. The MSG denomination marks this Japanese guitar as part of the Meister Series, but for less than £300, it is affordable enough to make an apprentice feel like he has usurped the Meister and taken over the dojo. 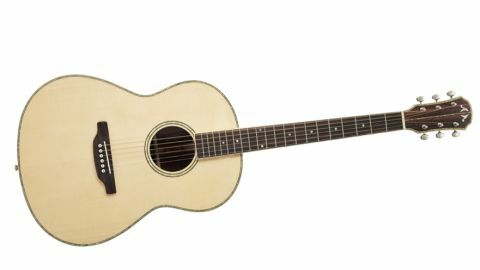 The guitar features a solid Engelmann spruce top which has a touch of grain on the natural finish to give it pride of ownership. The shapely grand concert size has a round body and sloping shoulders for an attractive look, an attribute that is replicated around the rest of the guitar. The top features marble-effect detailing around the soundhole, the edge of the top and the headstock. neck is bolted to the body. This small-but-neat touch highlights smart thinking and will make potential buyers feel like Aria has gone the extra mile in the design and manufacturing process. Rather than the standard Aria logo, the bolted headstock boasts an attractive two-piece look with the Aria ‘A’ on one side and an ‘M’ on the other. The split is bordered with a marble effect. Tuning pegs are not dissimilar to the recently-reviewed 111. If you want to record songs or perform on open mic stages, this could suit your needs to a point. The guitar came equipped with D’Addario strings, and it offered a range of expressive melodies, depending on where you played them. The Aria felt complete when strummed over the soundhole, had an extra melodic tone over the high-end of the fretboard and gave a sweet jangly noise closer to the rosewood bridge - you can play it anywhere with ease and retain a quality sound, something you struggle to find on guitars in this price bracket and below. There is only a single guitar-strap nut, and no electronics, so if you wanted to use this guitar to perform, you might prefer to play seated. The neat body size made it a pleasure to play on either knee. Unusually for us, we drew greater pleasure playing with a plectrum and the notes seemed to die sooner playing fingerstyle, but it was simple to pluck out harmonics and move smoothly between frets. If you would like something that looks good on your wall and doesn’t cost a bomb, the Meister Series is a solid option. Aria is currently producing expressive, entry-level acoustics that rank among the best in in the business.